Frama (19.05.1995) - Philatelic Exhibition Bruphila 95. Mint ATM small value (01.00). Frama (19.05.1995) - Philatelic Exhibition Bruphila'95. Mint set 3 values (13.00 - 16.00 - 30.00). Frama (2.03.1996) - Philatelic Exhibition EUROPHILA'96. Mint ATM small value (01.00). Frama (2.03.1996) - Philatelic Exhibition EUROPHILA'96. Mint ATMs (16.00-17.00-18.00). Frama (2.03.1996) - Philatelic Exhibition EUROPHILA'96. Mint set three values (14.00 - 16.00 - 30.00). Frama (2.03.1996) - Philatelic Exhibition EUROPHILA'96. Mint set four values (16.00 - 17.00 - 30.00 - 34.00). Frama (23.5.1997) - Philatelic Exhibition CAROLOPHILEX. Mint ATM small value (01.00). Frama (23.5.1997) - Philatelic Exhibition CAROLOPHILEX. 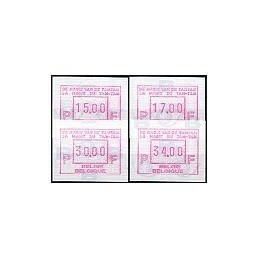 Mint set 3 values (15.00 - 17.00 - 30.00). Frama (23.5.1997) - Philatelic Exhibition CAROLOPHILEX. Mint set 4 values (16.00-17.00-18.00-30.00). Frama (10.5.1997) - Philatelic Exhibition KVBP 1937-1997. Mint set 3 values (15.00 - 17.00 - 30.00). Frama (10.5.1997) - Philatelic Exhibition KVBP 1937-1997. Mint set 4 values (16.00 - 17.00 - 18.00 - 30.00). 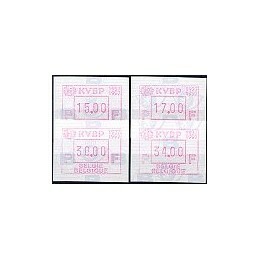 Frama (10.5.1997) - Philatelic Exhibition KVBP 1937-1997. Mint set 4 values (15.00-17.00-30.00-34.00). 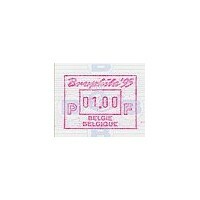 BELGIUM (1997). MAGIE VAN DE TAM-TAM. Set 4 val. Frama (5.10.1997) - Philatelic Exhibition DE MAGIE VAN DE TAMTAM . Mint set 4 values (15.00-17.00-30.00-34.00). Frama (17.10.1998) - Philatelic Exhibition Philabourse '98 CHARLEROI. Mint set 4 values (15.00-17.00-30.00-34.00). Frama (17.04.1998) - Philatelic Exhibition PHILEURO '98. Mint set 4 values (15.00-17.00-30.00-34.00). Frama (29.09.1999) - Philatelic Exhibition BRUPHILA '99. Mint set 4 values (17.00-21.00-30.00-34.00). 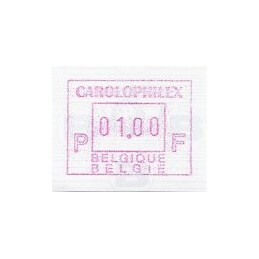 Frama (15.05.1999) - Philatelic Exhibition Philabourse '99 CHARLEROI. Mint set 4 values (17.00-21.00-30.00-34.00).